Hi, I just noticed this, in Hey Joe, Roger/Jim switches from usual Rickenbacker 370/12 to what looks like a 6122, maybe Crosby's back up? pg-Although you are most often associated with the Rick 12, you played other guitars with The Byrds. Can you tell us about those instruments and why and how you used them? rm-I had a Gretsch Country Gentleman strung with flatwound strings that I used on “Have You Seen Her Face”—that was The Beatles’ influence again. pg- I could have sworn that was a Telecaster. rm- No, it was a Gretsch. After Fender was taken over by CBS, we got a ton of Fender gear. They gave me a Mastertone banjo, which is the one I traded to Bernie, an electric 12-string that I used in the studio, an acoustic guitar and a Telecaster. I used the Gretsch a lot around the time Gram Parsons was in the band and we recorded Sweetheart Of The Rodeo. The Rickenbacker really didn’t fit too well with the country music we were playing. Quite possibly one of the worst versions of a tremendous song from a band that I dearly loved. Ouch! The Byrds were a hugely influential band, and I love their first 5 or so albums, but I've never once heard a live recording of them that sounded anywhere near as good as their records. Live they were often sloppy. It's puzzling, because individually they were all excellent musicians, but somehow they didn't gel onstage the way one would have thought. Or maybe we all just got used to the Wrecking Crew as the band on records --- hard to top Hal Blaine, Carol Kaye, Glen Campbell, Leon Russell & co.
... Loved the Byrds and them individually. Especially Gene Clark. Look at the vintage Gretsch's they're playing and have behind them. Stephen Stills' best band in my opinion. McGuinn near a Gretsch. Sorry, couldn't resist. Great pics thanks. Along with Brian Jones's 6118, it was Crosby's "STP" 6122 that got me into Gretsch guitars as a teen in the early 80s. Couldn't have said it better, Bob! Larry Knechtel is playing bass on the first Byrds records. Mr. Tambourine Man, etc. Actually, the Wrecking Crew only played on two of the Byrds' recordings, "Mr. Tambourine Man" and the B side "I Knew I'd Want You" which was written by Gene Clark. The rest of the Byrds' recordings were done by themselves. McGuinn has said in various interviews that it took them 77 takes to get "Turn, Turn, Turn" down. I believe that success came too quickly for the Byrds. They chose their drummer because he looked like a Rolling Stone (B Jones? ), despite the fact that he wasn't a drummer. They did their arrangements and got their instruments in an attempt to mimic (and cash in on) the Beatles sound ("Beatle-ized" folk music). They had a one 7" single deal from Columbia - make a hit and get a contract. 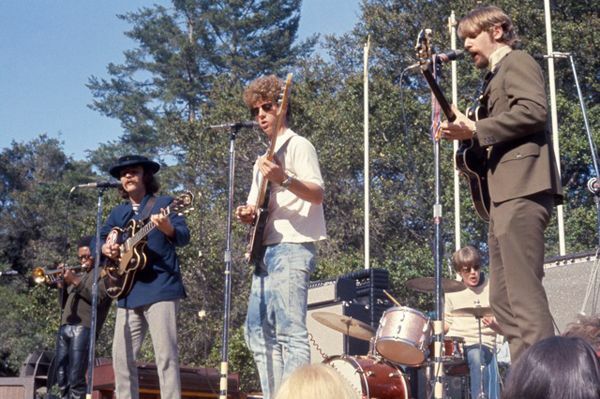 The primary motivating force of the Byrds seemed to be money. Because, as Jim K mentioned, they had the Wrecking Crew, McGuinn's distinctive 12 string Rick, and a Dylan tune as their first record, they stacked the odds for success of that single as much as possible. However, from many biographies I have read, they apparently had little regard for their live audiences. They would rarely rehearse, often show up late for gigs, tune endlessly, have little engagement with the crowd, cut the gig short (down to 20 minutes at times), and leave early if they didn't think the crowd was good. Contrast this with their idols, who slogged it out for years and mastered live performing well before they even stepped foot into a recording studio. I think that they skipped the 'paying your dues' part of success. They also got greedy about songwriting royalties. Once they found out how much more money Gene Clark was receiving, they would do things like demand a change of lyric or chord and then demand co-writing credit. They came up with a phrase, something like - "Change a word, receive a third"). The two main mercenaries seemed to be McGuinn and Crosby, who eventually started blocking some of Clark's tunes in favor of their own (lesser?) songs. It appears that they both kept their love of $$$ for life. It wasn't long before the revolving door of substitute Byrds musicians started filing in and out of the band, eventually becoming "Roger McGuinn and his sidemen". Like Parabar, I also loved their first 5 albums. After that, it was (to me) no longer the Byrds. How did he get such a TWANGY sound out of a Country Gentleman with Flatwounds?! I liked the concert footage. I'd not have been disappointed in the least to have witnessed that performance. I guess a little sloppy, but still engaging. Roger McGuinn has always come off as a pretty mild personality, so it's not too surprising that he's not lighting it up on stage. I saw McGuinn & Hillman last night doing the 50th Anni of the "Sweethearts of the Rodeo". They had Marty Stewart and his band with them. The Gretsch flatwounds were made in Germany. They do the wound strings with a round core, round wire wrap over the core wire and then a flat wire wrap over that. Makes for a pretty twangy string! I'm going to bet playing through a cranked Showman added to his twangy tone as well. I've never been able to get the sort of twang out of flatwounds as I can roundwounds. Does roger's Gent looks like it has Kidney tuners? I was thinking the same thing. Once the amp starts contributing harmonic chime, the distinction between flats and rounds starts to fade. Not sure if this is the same 6122 he used on Have You Seen Her Face. But its probably the Monterey 6122. Supertron and Kidney tuners.